Drone Wars UK has obtained the first detailed figures for use of armed British drones in Iraq and Syria since UK operations began in October 2014. A Ministry of Defence (MoD) response to a Freedom of Information request from the group show that the UK flew just over 100 armed Reaper missions in Iraq in the ten weeks up until 31 December 2014, launching 38 Hellfire missiles. 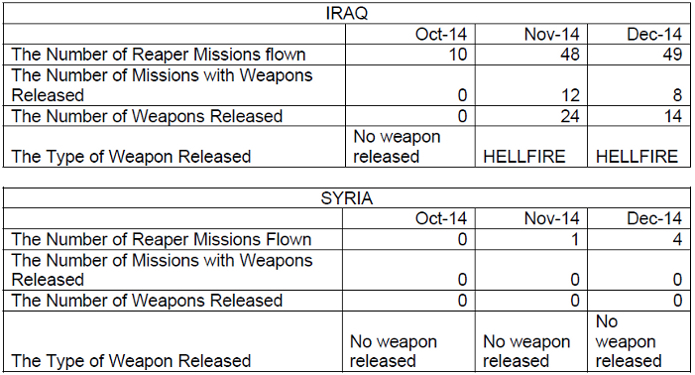 Although Parliament expressly granted authorisation only for the use of military force in Iraq, 5 Reaper flights took place over Syria although no weapons were launched. As there is little willingness to send troops to Iraq, and especially since the barbaric murder of captured Jordanian pilot Moaz al-Kasasbeh, the temptation to use drones to carry out more and more airstrikes in order to be seen to be doing something will grow. However without detailed intelligence from the ground, it is simply not possible to know exactly what – or who – is being hit, and reports of civilian casualties from coalition airstrikes in Iraq and Syria are already beginning to surface. Over the coming months, such reports, like the drone strikes, will no doubt increase.